Officers were called to the area of Ethel Street and Glenwood Avenue for a report of a mischief in progress. Police learned that two unknown males, dressed in all black, were striking the side mirrors of multiple vehicles with skateboards as they walked west towards Pandosy Street. A total of as many as 14 vehicles were identified by police as being damaged. 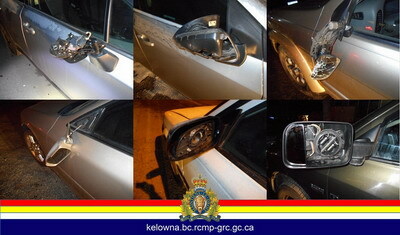 Vehicle owners in the area who discover damage to their vehicles are invited to call the Kelowna RCMP non-emergency line at 250-762-3300, and are asked to quote police file number 2018-3927. Anyone with any information, including the identity of the males involved is asked to contact the Kelowna RCMP at 250-762-3300. Or remain anonymous by calling Crime Stoppers at 1-800-222-8477, leaving a tip online at http://www.crimestoppers.net or by texting your tip to CRIMES (274637) ktown.